As the world’s largest and most diversified healthcare company, with 134,000 employees in 60 countries, Johnson & Johnson works with over 70,500 suppliers across its three business segments Tweet This! : Consumer, Medical Devices and Pharmaceutical. Building a socially and environmentally responsible supply chain is, thus, a key priority. This case study is based on the 2017 Health for Humanity Report by Johnson & Johnson published on the Global Reporting Initiative Sustainability Disclosure Database that can be found at this link. 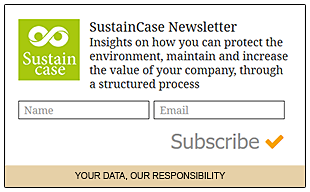 Through all case studies we aim to demonstrate what CSR/ sustainability reporting done responsibly means. Essentially, it means: a) identifying a company’s most important impacts on the environment, economy and society, and b) measuring, managing and changing. In its 2017 Health for Humanity Report Johnson & Johnson identified a range of material issues, such as product quality, safety and reliability, ethics and compliance, innovation, global public health, workplace safety. Among these, promoting environmental and social responsibility throughout its supply chain stands out as a key material issue for Johnson & Johnson. To identify and prioritise material topics, Johnson & Johnson invited more than 1,500 stakeholders to respond to a survey. Stakeholders were asked to rank topics by importance to them and by their potential for social, environmental and economic impact. 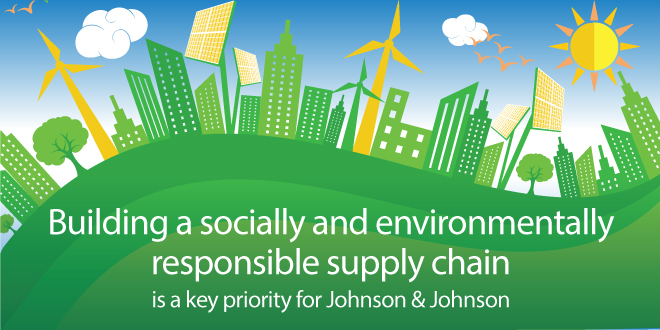 What actions were taken by Johnson & Johnson to promote environmental and social responsibility throughout its supply chain? Johnson & Johnson confirms and monitors suppliers’ compliance with its Responsibility Standards for Suppliers by means of a formal assessment and audit program. 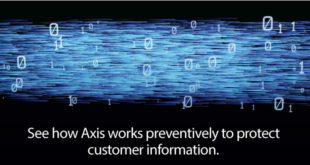 Assessments are conducted through EcoVadis – a third-party program. EcoVadis assessments involve an initial screening of supplier performance. Subsequently, the results (a score) play an important role in deciding which suppliers may require an on-site audit. In 2017, Johnson & Johnson carried out 189 EHS audits and technical visits. In 2017, to establish an enterprise-wide framework for addressing human rights in its supply chain, Johnson & Johnson expanded the human rights requirements in its updated Responsibility Standards for Suppliers. In addition, a cross-functional Human Rights Working Group met regularly, guiding and informing the development of Johnson & Johnson’s human rights risk assessment approach and audit program. Johnson & Johnson’s supplier social audit program is scheduled to be fully implemented in 2018. Supplier selection and prioritisation criteria will include results for EcoVadis scores regarding Labour and Business Ethics, location in a country considered high risk for violation of human rights and the supplier category. Note to Johnson & Johnson: With each case study we send out an email requesting a comment on this case study. If you have not received such an email please contact us.